Mere Fidelity is a weekly podcast hosted by Mere Orthodoxy, tackling a wide range of theological, ethical, social, and biblical topics. Along with Derek Rishmawy, Andrew Wilson, and Matt Lee Anderson, I am one of the regular participants. You can follow the podcast on iTunes, on Soundcloud, or using this RSS feed. 2. Do Calvinists Worship Another God? 3. Is There Such a Thing as ‘Moral Orthodoxy’? 13. What’s Wrong (and Right) with ‘Relatability’? 14. Begotten or Made? Chapter 4: And Who Is a Person? 19. Should We Hope to Die at 75? 64. Have Evangelicals Become Too Obsessed With Politics? 67. What Is Appropriate In Worship? For an up-to-date list of episodes, visit this page. No, I didn’t come up with the reading myself, although I have developed it in various ways. Unfortunately, I don’t know who first came up with the reading. I heard it presented at a Reformed theological conference in Ireland well over a decade ago now that I attended with my father. I can’t remember the name of the person who presented it. That dissertation subject sounds fascinating! I’d love to hear more about it as your work develops. Have you considered a show on satire? Believers who are also agents, editors, and publishers are reluctant to consider satire. Terry Lindvall’s Surprised by Laughter, and his God Mocks (scholarly) history of satire, might be one starting place. If you might consider getting him on the show, especially if he ever makes these books more accessible to the layman. But listeners like to know what you think. Is there now a legitimate place for such satire? Is it dangerous — as the blurb for Lindvall’s book (on Amazon) has it? What would those dangers be? Another example is Alan Jacobs arguing that CS Lewis’s fictive gift isn’t so much the fantastic as it is satire. That is, his satire may be better than his storytelling. (According to Jacobs.) Is satire to be found in parables or sermons of the Lord Jesus? Is this in reference to Scot McKnight’s recent post? Yes, that would be a very good topic. thanks for the link. i hadn’t seen it. i’m not thinking of internet satire targeting individuals, but the literary form. writers who produce satire may be interested in a discussion of the genre’s possibilities, not only for entertainment (which must be one of its qualities), but for showing culture and the human condition in fresh ways. Showing in ways that remove custom and cliché from our everyday reading and cultural encounters. Secular culture has no difficulty satirizing the culture of Western Christianity (neither do Christians themselves), but from a believer’s POV cultural impasse can be made fun (of) and seen in refreshing ways; the gospel can be refreshed for the jaded views of both cultures. Satire of the way we live, how we interact with God…. but I’m thinking formal … not personal attacks. The discussion on MF was engaging. Thank you. I hope believers in the business end of publishing will begin discussing satire, whys and wherefores. Perhaps they feel it would be bad for business, or that satire gets enough www exposure and does not need formal vetting. what is free will? is there an agreed definition? 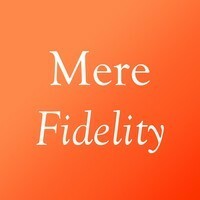 mere fidelity seems not to have done this topic yet? “on plagiarism” was interesting. thanks! Thanks for the suggestion; I’ve passed it on to the guys and will see whether they are interested.